Whenever I talk about a “ragu” it’s usually a meat based sauce served with some type of pasta. In this case, I thought that the soft billowy texture of a potato Gnocchi, would be perfect. Let’s start with the ragu. Most likely than not, Porcini mushrooms come in dried form. First, the rehydration process of the mushrooms. I like to use low sodium beef broth for soaking the Porcini mushrooms. On the stove, I add the 1 package ( usually about 4-5 ounces in a package) of dried Porcini mushrooms to a small sauce pan. I then cover the mushrooms with the beef broth. On med high heat, I bring the mushrooms in the broth up to a boil, reduce to a simmer, and cook for about 15 minutes or until the mushrooms have plumped up. I don’t throw away the broth, because that has a lot of flavor. Using a slotted spoon I remove the mushrooms from the liquid. Next, I chop the mushrooms up pretty finely and set them aside with the cooking liquid. In a non-stick saute pan on med high heat, I added a pound of sweet Italian sausage that I just broke that up with the back on my wooden spatula. I really love the fennel taste that’s in sausage, so to reinforce that anise flavor, I added in 1 teaspoon of fennel seeds (optional) to the sausage while it’s browning. I let that saute until all the sausage was caramelized and brown. That took about 10-12 minutes. In the mean time I diced up a large sweet onion and minced up 3 cloves of garlic. After the sausage was done browning, I removed it from the pan using a slotted spoon to allow some of the excess fat to drain off. I placed the browned sausage into a bowl until I was ready for it. I’m using a deep sided saute pan for this recipe. It really works well for making any type of ragu. I have the pan on the stove on getting hot on med heat. First I add in the olive oil, then, the diced onions and let those soften for about 2-3 minutes. Next, I add in the chopped Porcini mushrooms to the pan along with 1 tablespoon of fresh thyme leaves, Kosher salt, and black pepper. I let those saute for another 2 minutes. Remember the mushroom liquid that I reserved from re-hydrating the mushrooms? Well, I use 1 cup of that mushroom stock and add that right into the pan with the mushrooms and onions. I wait for that to come up to a bubble and reduce it to a simmer, scraping all those good bits off the bottom of the pan with my wooden spatula. Once most of the mushroom liquid has reduced to a couple of tablespoons, which really reinforces that mushroom flavor, I add the sweet Italian sausage back into the pan. Still having the pan on med heat, I toss the sausage through with the mushrooms and let that cook together for another couple of minutes while I get some crushed tomatoes ready to add in. This is the time when I check the seasoning again. If it needs a sprinkling of salt and pepper at this point than I add it. but because I seasoned it earlier, it’s perfect. I add the minced garlic into the pan.This insures me that garlic will become sweet and tender and not burn. Now I add the crushed tomatoes and stir that through. I cook the tomatoes with the sausage and mushroom mixture for another 3-5 minutes. This gives the sauce a chance to cook down and flavor the other ingredients. At this point, I turn the heat down to low and stir in some heavy cream. This gives the ragu have a luxurious texture. Once the cream is stirred through, I have the burner set on warm while I wait on the Gnocchi to cook. This takes really no time at all. I have to say that I’ve made homemade Gnocchi before and it’s terrific. but they have some really great store bought ones today. On another burner I add some salted boiling water boiling away. This way while I was finishing up the ragu, all I needed to do, was to throw the Gnocchi into the water. They cook really fast. Once they float to the top they’re done. Using a large colander spoon, I scoop out the Gnocchi and place it right into the ragu. Toss the Gnocchi through gently. Don’t worry if some of the pasta cooking water gets into the sauce that’s fine. The Gnocchi will absorb any extra starchy cooking liquid that gets into the ragu. This ragu is so delicious and hearty. 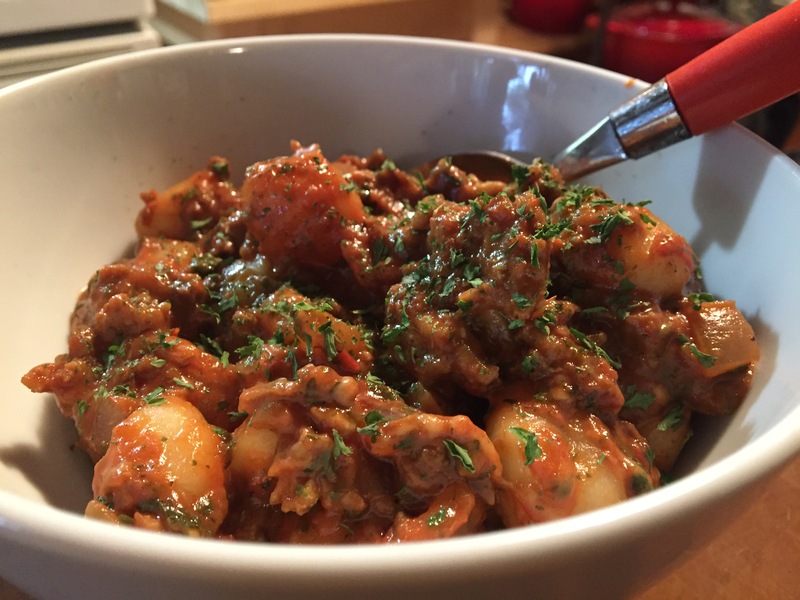 The ragu clings to the Gnocchi. I turn the heat completely off now before adding in the Parmigianno-Reggiano cheese. Finally garnish with fresh chopped Italian flat leaf parsely. First you need to re-hydrate the mushrooms in low sodium beef broth. ?Remove the mushrooms, chop them up, and reserve the mushroom liquid. Next, brown off the sausage with the fennel seeds,. While the sausage is browning, dice up the onion and mince the garlic. When the sausage is done about 10- 12 minutes, drain the fat, and set the sausage in a bowl to the side. Have a pot of water on stand- by for cooking the Gnocchi on the back burner while you start the ragu. In a large deep side saute pan that’s been heating up on med heat,.add in the olive oil, then the diced onion.Season the onions with Kosher salt and pepper, and let that soften for 2-3 minutes. To that add in the chopped Porcini mushrooms ,and the fresh thyme leaves and toss that through with the onions. Add the cup of mushroom stock and reduce to a couple of tablespoons left in the pan. Next, add the browned of sausage back in with the minced garlic. Stir that through. Taste for seasoning again. Because I seasoned earlier in the making of the sauce, I find it doesn’t need any more salt and pepper. At this point turn the water on high to boil for the Gnocchi. Let this simmer for about 3-5 minutes. Turn the heat down to low and add in the heavy cream.. Stir the cream through and turn the stove down again to “warm” while you add the Gnocchi into the boiling salted water. The Gnochhi cooks really fast. When it the Gnocchi floats it’s done. Using a colander spoon transfer the Gnocchi right into the pan with the ragu. Toss it through gently. Turn the heat off completely before adding in the cheese, and toss that through. Garnish with flat leaf Italian parsley. In Orlando, we call it “Restaurant Row”. Located on West Sand Lake Road, are some of the best restaurants Orlando has to offer. These restaurants are not located in a theme park, nor are located on International Drive, know to tourists. They’re just conveniently located close enough, where “the locals” can get dressed up, take a 20-30 minute drive, and enjoy some great dining. Vines Grille and Wine Bar offer “high end” steaks, prime rib, and an extensive wine collection. Not to mention, they have live Jazz and Blues music. Located at 7533 W. Sandlake Rd. Orlando, Fl. 32819. For more information visit their website at www.vinesgrille.com. Cheesecakes, besides being decadent and delicious, I believe are one of the most popular dessert item found on restaurant menus. Whenever I’m making a cheesecake, I think about the three things. First the crust, then the filling, and finally the topping. Of course, the traditional is only comprised of two of these, the crust and the cheese filling. Let’s face it, cheesecake lovers are always trying to invent new ways of sprucing up the traditional with fruit, chocolate, and even making a savory one. What I really want to talk about first is the batter. The body of the dessert. My personal preference is, to prevent the eggs from curdling or the cheesecake from cracking. I like to use a water bath, a gentle heat, for the baking process. When using corn starch and flour, in the batter, the starch will prevent the eggs from curdling. I’ve also have found after the cheesecake has baked for an hour, leave the cheesecake, in the water bath, in the oven, with the heat off, and oven door cracked open, for another hour. This will ensure that you won’t have a cheesecake with those little annoying cracks in the top. The residual heat, in the walls and left in the water bath, will radiate enough heat to complete the baking process. It’s a personal preference that I choose to use a little flour in the batter. I like the creamy, silky yet firm texture to the finished dessert. Now if I were making a savory version, then I would incorporate flour and corn starch in the batter, because I would want a slightly firmer texture. No matter savory or sweet, the gentle heat of a water bath is always the method I use. First, I start with the strawberry filling. I start with fresh strawberries that I’ve hulled and halved. Add to a food processor. I then add in a small amount of corn starch and pulse the strawberries until they were completely pureed. Next, pour the pureed strawberry mixture into a small sauce pan. On med high heat, add fresh lemon juice, granulated sugar, and strawberry preserves. Bring this up to a boil, constantly stirring, I cooked the mixture until shiny and thick. This takes about 5 minutes or so. You’ll see that the sauce has thickened when you run your finger down the back of a spoon and it stays separated. Remove the sauce from the heat, place into a bowl, then into the frig, allowing the sauce to chill. I have lined my spring form pan with foil to make sure no water gets into the cheesecake while it’s baking. I tell you about that later. I combined two types of graham crackers for my crust. Honey and cinnamon sugar grahams. In a food processor with the metal blade, I process to grahams until they are in the form of crumbs. I add them to a bowl with sugar and melted butter. I stirred that all together until the grahams looks like wet sand. In a 9 inch spring form pan, I press all the crumbs onto the bottom of the pan. Next, I refrigerate the crumbs for a least 30 minutes. This gives me time to work on the cheese filling. In my stand mixer, with the paddle attachment, I add room temperature cream cheese and Mascarpone cheese. I beat that until light and fluffy. Once that’s light and fluffy, I turn the speed down to low and I add in, lemon zest, sour cream, pure vanilla extract, the caviar of a vanilla bean. To that, I gradually add in sweetened condensed milk.. In a small bowl I have three large eggs that I’ve cracked open. Still on low speed, I add the eggs, one at a time, to the other ingredients, until just combined. Turn the mixer off. I take the chilled crust and strawberry filling out of the frig. I pour half of the cheese filling into the pan. Using a regular tablespoon, filled with the strawberry filling, I spoon on dollops of the strawberry filling onto the first half of the batter. Then I pour the rest of the cheese batter carefully over that. Next, I repeat placing dollops of strawberry filling on the top of that layer of cheese filling. I have a long skewer. that I take the pointy end, and very carefully not to go through to the second layer of filling, I just swirl the strawberry filling around in a swirly design. Like you see in the picture above. I have on the stove top a tea kettle filled with hot water. I also have a large roasting pan, one big enough to hold the spring form pan in, I set the unbaked cheesecake into the roasting pan. Remember the foil I spoke of, well this is why you need to wrap the pan with foil. I’m filling the roasting pan with the hot water so it comes up 1/4 way up the pan. A few inches is just fine. This helps the cheesecake to bake evenly and gently. Bake at 300 degrees for 50-60 minutes or until the center is almost set. Next, I turn the heat off in the oven. I leave the cheesecake in the roasting pan, still filled with water, but I crack the oven door so it’s open slightly. I let the cheesecake sit in the oven for another hour. Finally I pull it out, take the pan out of the water. I let it cool out of the water for another 1/2 hour, then I remove the foil. I take a sharp thin knife and run it around the outside of the cake, just to loosen it a little from the sides of the pan. I place the cheesecake still in the pan, into the frig overnight. The next day, whenever you’re ready to serve, remove the spring form attachment and place the cheesecake, carefully onto a serving platter. I bought 1 bar of bakers white chocolate that you break up into pieces. Place the chocolate into a microwave safe bowl. You want to microwave the chocolate in 30 second intervals stirring it between each 30 seconds until the chocolate is just melted. I take a fork, dip it into the melted chocolate and shake the fork all over the top and sides of the cold cheesecake. The chocolate will harden pretty fast because the cheesecake has just come out of the frig. I use a very large and fat spatula that I slide carefully under the crust for transferring the cheesecake. You could also just leave it on the bottom of the spring form pan and serve from there. First start with preparing the 9 inch spring- form pan. Next, process the strawberries with corn starch. Place into a sauce pan on med high heat. Add in the sugar, strawberry preserves,and lemon juice. Once the filling has thickened, about 5 minutes, remove the strawberry filling from the heat, transfer to a bowl and refrigerate. Next, process the two style of graham crackers. Stir the cracker crumbs and sugar together. To that add in the melted butter. The crumbs should look like wet sand. Press the crumbs into the bottom of the spring form pan. Once in the pan, refrigerate that as well. Both need to be in the frig for at least 30 minutes. The last component is to make the cheese filling. In an electric or stand mixer, add in the softened cream cheese, Mascarpone cheese and flour, beat until light and fluffy. Next, add in lemon zest, sour cream, vanilla extract, and the caviar of the vanilla bean. With the mixer on low. add in the sweeten condensed milk gradually. Finally, add in the room temperature eggs one at a time until just combined. Turn the mixer off. Take the crust and strawberry filling out of the frig. Pour half the batter into the pan. Spoon dollops of strawberry filling onto the batter. Then pour the other half of the batter carefully on top, not to disturb the strawberry dollops. Then repeat the spoonfuls of strawberry filling in the top half. Using the pointy end of a skewer, make swirly designs making sure not to go through to the bottom layer. Just draw the swirls really lightly on the top. Set the filled spring form pan into a large roasting pan. Have the hot water ready to add in so it comes up about a 1/4 of the way up the pan. A good tip is, to set the roasting pan with the cheesecake in the pan, and in the oven first, before adding in the hot water. Bake for 50-60 minutes then turn the oven off leaving the pan in the oven with the door ajar for another hour. Remove the cheesecake from the roasting pan and let sit out until room temperature. Remove the foil from around the pan and refrigerate over night. The next day, melt the chocolate in the microwave as explained on the back of the package. Remove the spring form pan from around the cheesecake. Drizzle the melted white chocolate over the cake and down the sides with a fork. The cold cheesecake will harden the chocolate pretty fast. I like to place my cheesecake in the freezer for around 2 hours. This hardens the cheesecake and will help with even slices for serving. Once you’ve sliced the amount you are going to serve, let sit a room temperature for 10-15 minutes. To slice the cheesecake, take a sharp knife, dip into very hot water, before slicing each piece.